An on-site casino and restaurant an indoor pool and hot tub and free Wi-Fi make the Rainbow Hotel Casino a fun place to kick back and enjoy a gambling getaway. The two-story Rainbow Hotel offers 89 rooms with free Wi-Fi coffeemakers microwaves refrigerators and TVs. Guests can try their luck at the on-site casino relax with a dip in the spacious indoor pool and hot tub or hit the fitness room for a workout. Hungry guests can pick up a snack at the 24-hour on-site deli. Pets are permitted. Parking is free. Non-smoking rooms are available. The hotel is located off Highway 61 one mile off I-20 and five miles south of downtown Vicksburg the Vicksburg Convention Center and the Warren County Courthouse. There are a wide range of dining options within a mile of the hotel. Guests who decide to venture off-site for gambling are five minutes from Riverwalk Casino Ameristar Casino and Diamond Jacks Casino. 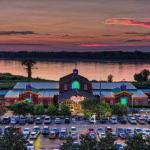 Shoppers can try their luck at Vicksburg Factory Outlets five miles away or Pemberton Square Mall two miles away. Jackson-Evers International Airport is 56 miles from the hotel.